William Bernard Chessbourg, Jr. began his career at age 11 on A Mountain in a Soap Box Derby car. The tires (made from an old rubber garden hose) fell apart, however, and Bill came up short. But at age 19, he won at the Kinsley Ranch in a 1932 Ford Roadster, by such lead that the 2nd place car hadn’t crossed the finish line while Bill was already collecting the $1,000 purse, in $1 and $5 bills. Bill and that Ford went on to win 73 out of 75 races. In 1957, Bill entered his first of seven starts in the Indy 500 and set a record that has yet to be broken: passed 17 cars on the first lap. If it had wheels, the “Cheez” would drive it, and drive it fast!… from the jalopies of his youth, to stock cars, to a bullet car, which he drove in excess of 300 mph. In virtually ever kind of machine on every kind of track, he racked up trophies, prize money, friends, and fame. Later in life, Bill climbed behind the wheel once again in an electric-powered Volkswagan at Phoenix International Raceway. The clock turned back as the “Cheez” blew everybody’s doors off and found himself in the winner’s circle one last time. 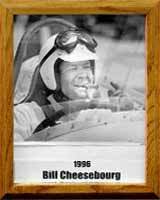 In August 1992, Bill Cheesbourg became the first inductee into the Tucson Raceway Park Hall of Fame. Bill Chessbourg died in 1995, a winner to the last finish line!